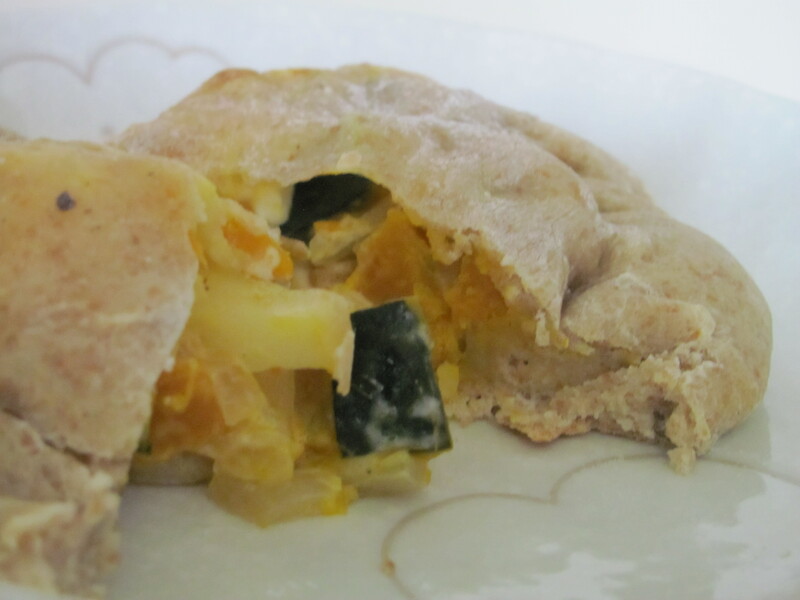 The Apple Chronicles, Part 2: Kabocha-Apple Whole-Wheat Turnovers – I'll Make It Myself! 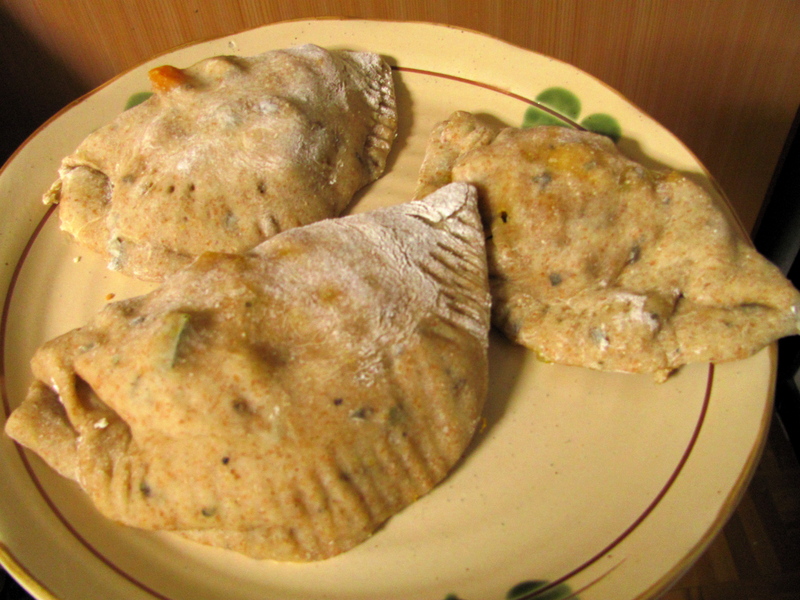 One recipe I had wanted to make for a while was “Squash-Apple Turnovers” from Cooking Light, but I was deterred by the use of canned biscuit dough. Not only is that not in the spirit of this blog, but you simply can’t buy that kind of thing in my neck of rural Japan. (I suspect I would be hard-pressed to find it anywhere but a big import store in Japan, but I’ve never seen any while hunting down peanut butter.) I decided to alter Cooking Light’s “Sage Dinner Rolls” to become the crust, and it actually worked perfectly—I didn’t have extra dough or filling. This would be a great dish at your next expat Thanksgiving party, since it tastes like home but you can find all the ingredients easily in Japan. If your store doesn’t have sage, you can substitute thyme. If you are using frozen kabocha, boil for ~5 minutes to soften it enough to dice; drain well before using. Reheats very well; may freeze in freezer bags. Dissolve yeast and honey in warm water in a large bowl and let stand 5 minutes. Combine 260 grams (2 1/4 cups) all-purpose flour, wheat flour, sage, salt, and pepper. Add flour mixture and oil to yeast mixture; stir until a soft dough forms. Place the dough on a floured surface. Add remaining flour 1 Tablespoon at a time to prevent dough from sticking to hands. (You may need more depending on how the dough turned out.) Knead until smooth and elastic (~8 minutes). Place dough in a large bowl coated with cooking spray or a little olive oil, turning to coat top. Cover and let rise in a warm place (29°C, 85°F) for 1 hour or until doubled in size–I preheated my oven range and set the dough in there to keep it away from drafts. Use this time to make the filling. Preheat oven or oven range to 190°C (375°F). Heat olive oil in a large skillet over medium-high heat. Add onion; sauté for 3 minutes. Add squash; sauté for 5 minutes. Add apple; cook 6 minutes or until squash and apple are tender. Stir in salt and pepper. Remove from heat. Gently stir in cheese and thyme; let the cheese melt. Cool to room temperature. When the dough has doubled in size (about 1 hours), gently press two fingers into dough. If indentation remains, the dough has risen enough.) Punch dough down; cover and let rest 5 minutes. Divide dough into 12 equal portions, shaping each into a ball. This dough is quite elastic; roll out thinly to the size of about 18 cm (7 in) in diameter. Spoon about 1.5 Tablespoons of the kabocha mixture onto half of each circle, leaving a ½-cm (1/4-in) border. Fold dough over filling; press edges together with a fork to seal. Brush milk over dough. Place turnovers 2 cm (1 in) apart on a baking sheet lined with parchment paper or lightly coated with cooking spray. Bake at 190°C (375°F) for 20-30 minutes or until golden brown. Serve warm. Store extra in refrigerator for up to 5 days or in the freezer in freezer bags. Reheats well. Pingback: The Apple Chronicles, Part 1: Applesauce « I'll Make It Myself! Pingback: The Apple Chronicles, Part 3: Very Lemony Apple Jam « I'll Make It Myself! Pingback: Appreciation: The Liebster « I'll Make It Myself! Pingback: Apricot-Sage Cream Scones | I'll Make It Myself!